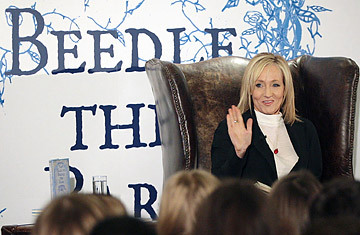 JK Rowling reads excerpts from her new book 'The Tales of Beedle The Bard' to schoolchildren at a tea party at Edinburgh's Parliament Hall. In Chapter 7 of Harry Potter and the Deathly Hallows Hermione is presented with a copy of a book called The Tales of Beedle the Bard, which Professor Dumbledore left her in his will. (Yes, he's dead. Sorry. Spoiler alert.) Because Hermione, like Harry, grew up in a Muggle family, she's never heard of the Tales, which are decribed as Aesop-like children's stories to be read to little wizarding kids. "Oh come on!" Ron says  he can't quite believe it. "All the old kids' stories are supposed to be Beedle's, aren't they? 'The Fountain of Fair Fortune'...'The Wizard and the Hopping Pot'...'Babbitty Rabbitty and Her Cackling Stump'." Beedle is, as advertised in Deathly Hallows, a small book  111 pages, and that's with an introduction, an afterword, triple spacing and margins into which you could fit a Hungarian Horntail. None of the stories in it are bad  I don't think J.K. Rowling knows how to be less than charming in print  but they do vary in quality. The first tale, "The Wizard and the Hopping Pot," is the worst, a grimly heartwarming trifle about how you should be nice to Muggles. "Babbitty Rabbitty and Her Cackling Stump," a variant on the emperor's new clothes, isn't much more successful, though it was a relief to me to learn that the stump in question is a tree stump and not some kind of chortling severed limb. There's more to Beedle than the stories: each one comes with commentary by Dumbledore. These sections are the purest pleasure the book has to offer  Dumbledore has always been Rowling's most extravagantly enjoyable voice, and he's in full cry here, wise and funny, taking shots at the Malfoys and at himself with equal enthusiasm. (You won't find him noticeably diminished or enhanced by his posthumously revealed gayness.) Beedle also comes with amateur but elegant illustrations by Rowling  she's not as good an artist as, say, Mary GrandPré, but then again Mary GrandPré isn't J.K. Rowling. It's interesting to get a sense of how the sorceress herself envisions her creations. I take exception to Rowling's stated theme, expounded in the introduction to Beedle, which is that "magic causes as much trouble as it cures." I'm just not convinced that if I could accio beer my life would not be significantly easier. But that may be because I still haven't absorbed all the wisdom Rowling has to offer. For example, I still find it hard to resign myself to the reality that this may be the last fresh taste of the Potterverse we ever get, outside of fan fiction. In fact you could read the last story, "Three Brothers," not just as a fable about learning how to let go of life, but also about learning how to let go of Rowling's tantalizing, addictive, ecstatic wizarding world. It's not easy. Willingly or unwillingly, we all have to. We just don't have to like it.